Sisterhood engages in fundraising activities throughout the year, so that we can offer programs to the community and raise money to fulfill the mitzvah of tzedakah (charity). We strive to have community building as a key component of any fundraiser that we undertake. 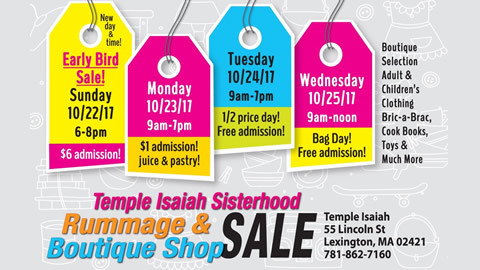 The Rummage Sale is one of Temple Isaiah Sisterhood’s most important fund raisers and most important community services. Every year we send hundreds of post cards to families who have asked to be reminded about this event. We receive notes from parents telling us they could not provide proper clothes for their children without our Rummage Sale. Please dig deep into your closets, drawers, and cabinets for donations. Search your schedules and find some time to help. Don’t wait for us to call you, please call us and let us know when you are available. Your donations, your volunteer work, and your purchases are appreciated by many. Community service letters are available for high school students. Tax receipts are available to donors. The sale always runs from a Monday thru Wednesday, with collection of goods on the preceding Sunday morning. The Rummage Sale is open to the general public. Every year, Sisterhood sponsors a Marketplace in the month before Chanukah. Over 50 artists and artisans participate in this annual craft fair. Buyers can choose from handcrafted items. Browse through baby and children items including clothing, educational toys, dolls, bibs, and bedding. Try on some of the adult clothing, flip flops, hair supplies, knit sweaters, hats, scarves, pashimas, jewelry and handbags. Browse through household items such as ceramics, metal sculptures, and several different types of wood creations. Shop our classic and new vendors as well as our Temple Isaiah Judaica Shop. We also sell homemade lunches, snacks and desserts. Proceeds from the Marketplace benefit over 50 charities, from hospices to women's shelters and breast cancer research, as well as Israeli and international Jewish organizations. The Sisterhood Holiday Marketplace is open to the general public. The Sisterhood also runs the Judaica Shop, which is open most Sundays between 9:00 and 1:00 when the Hebrew School is open as well as other times when we have volunteers to staff it. Sisterhood members are encouraged to volunteer at the Judaica Shop. Call the telephone number posted on the door of the Judaica shop to arrange an appointment to shop outside of our regularly scheduled hours. Call with questions, for an appointment or to volunteer. You may also email us at the Temple Isaiah Judaica Shop. The game of Mah Jongg seems to be getting more and more popular, with new players learning the game every year. There will be competitive play for those who are confident at the tables, and a Casual Corner for those who love the comradery and fun, but who do not wish to compete. EVERYONE is WELCOME! There will be cash prizes for the top winners in the tournament, and Mah Jongg items for game winners in the Casual Corner. This is a fundraiser, so in addition to the entry fee, we will be offering raffle tickets for gift baskets and some fun Mah Jongg items! Proceeds from the event benefit over 50 charities, from hospices to women's shelters and breast cancer research, as well as Israeli and international Jewish organizations. The Mah Jongg Madness Tournament is open to the general public and will be held Sunday, March 3, 2019. For more information, view the flyer. Register online here. Proceeds of this event will be donated to the Sisterhood Legacy Fund, which is an endowment fund in the family of funds of Temple Isaiah.